This fact sheet provides information on craniotomy. This fact sheet provides information on craniotomy. Our fact sheets are designed as general introductions to each subject and are intended to be concise. There are different reasons for having a craniotomy and each person is affected differently. You should speak with your doctor or specialist for individual advice. A craniotomy is an operation to open the head in order to expose the brain. The word craniotomy means making a hole (-otomy) in the skull (cranium). The operation is carried out by a neurosurgeon who specialises in surgery of the brain and spine. Why do I need a craniotomy? 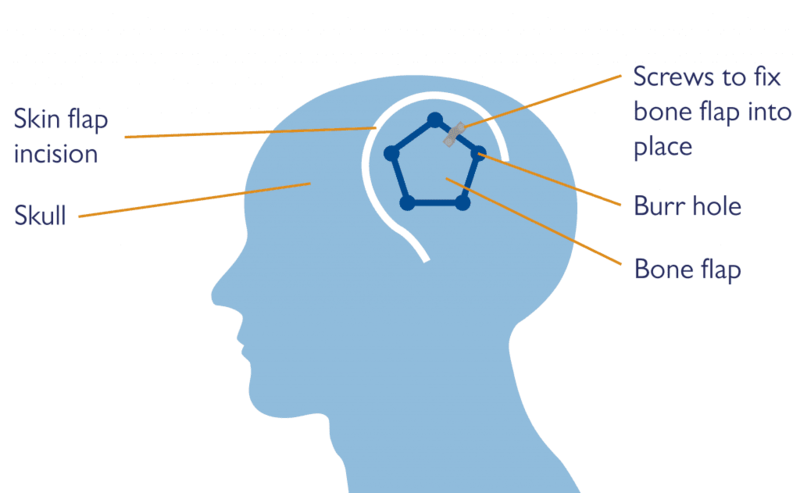 The most common reasons for having a craniotomy are a subarachnoid haemorrhage (a bleed over the surface of the brain), a brain tumour (an abnormal growth of cells in the brain), or a serious head injury. What happens before the operation? 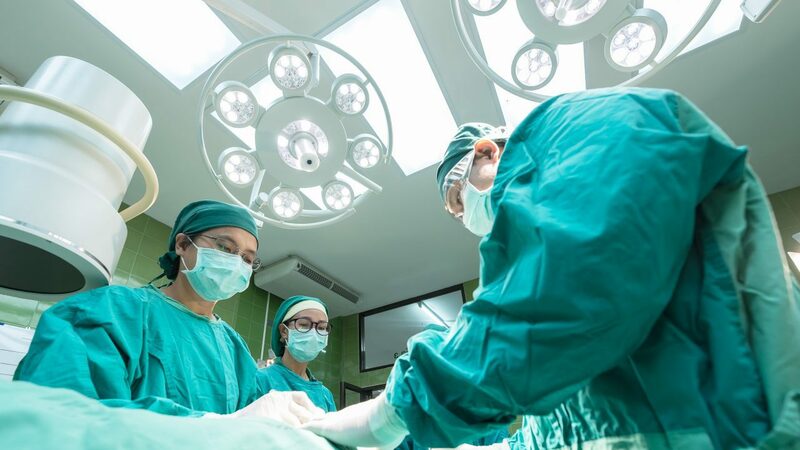 The surgeon and anaesthetist will ask you about your general health and any medical conditions that could increase the risks of surgery before deciding when to do the operation. The operation is usually carried out under a general anaesthetic which means you will be asleep throughout and will not feel anything. A small horseshoe-shaped area of your scalp is shaved over the point at which the surgeon needs to operate. An incision (cut) is made in the scalp, a skin flap is peeled back, burr holes are drilled in the skull, and then a piece of bone (“bone flap”) is cut out like a trap-door to reveal the brain underneath. The surgeon then begins work: to close the connection between a blood vessel and an aneurysm with a small clip, to remove all or part of a tumour, to remove a blood clot, or to relieve pressure on the brain. The bone flap is then replaced and the scalp is stitched together. The bone flap is usually fixed into place with small metal screws to prevent movement and encourage better healing. The operation takes approximately 4-6 hours. This includes the time to transport you from the ward to the operating theatre, giving you the anaesthetic, the operation itself, and the time you spend recovering from the anaesthetic. You will usually be woken up as soon as the operation is over. You will regain consciousness in the recovery area where special nurses monitor your progress very closely. Occasionally, intensive monitoring is required, and you might be transferred to an intensive therapy unit or a high dependency unit. You might then be kept asleep on a breathing machine for a period of time after the operation to allow your brain to recover. If this is likely to be necessary, your surgeon will discuss it with you before the operation. Once you have been transferred back to the ward you will be carefully observed and monitored. You will be given fluids through a drip into your vein. You might also have a drain to remove any fluid oozing from the wound. Sometimes a fine tube (catheter) is placed into the bladder to help you pass urine. All of these tubes will gradually be removed as your condition improves. What problems might I experience after the operation? Very rarely, a blood clot might form on the surface of the brain at the site of the operation. If this happens, depending on the size of the clot, you might need a second operation to remove it. Otherwise, the doctors and nurses will monitor your condition. During a craniotomy, a small cut is made in the muscle that helps with chewing. As it heals after the operation, the muscle can be slightly shortened causing the jaw to feel stiff. You might have difficulty in opening your mouth. This problem usually clears up after a couple of months. Chewing gum can help to resolve this problem. It is common for there to be swelling and bruising to your face. Your eye might be closed for a day or two. The nurses will bathe your eyes for you. As the wound in your head heals, it might feel painful and you will be offered pain-killers to help relieve any discomfort. This gradually improves and is usually better by the time the stitches are removed, three to five days after the operation. Some surgeons use stitches that dissolve and so do not need to be removed. The skin around the edges of the wound might feel a bit numb until the healing is complete. The numbness might be painful or unpleasant and the wound might also feel itchy or very cold. This might persist for a few months. Wound infection is not usually a problem. Antibiotics are often given around the time of the operation as a preventative measure. Lumps or indentations around the wound are common. The bone flap (the piece of bone cut out during the operation) might feel like it moves. Because the pressure in your head can vary, the flap of bone might move in and out very slightly. You might experience a “clicking” sensation. Although this feels strange, it is not dangerous. The bone flap is not loose: it is secured when it is replaced and will heal back into place. Headaches are common and might last for several months before they gradually settle down. Some people find that their headaches persist for a longer period of time. What will happen to my hair? Usually, only a small area of your head will be shaved. You are unlikely to have your whole head shaved. After the operation, your hair will grow back where it has been shaved. Once the wound on your head has healed, and your stitches or clips have been removed, you can wash your hair and use hair products as usual. You can also dye or treat your hair once the wound has healed.